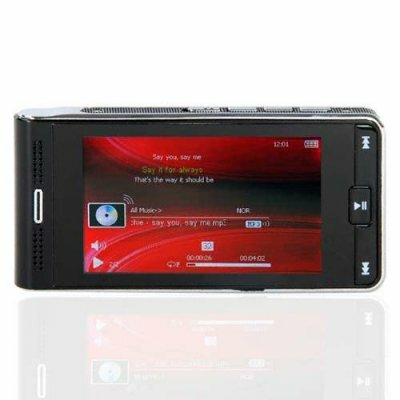 Successfully Added Hot New 8GB Widescreen MP4 Player With 3 Inch LCD to your Shopping Cart. PMP (portable media player) with 3 inch 16:9 screen and 8 GB's of memory. Looking for a new MP3 and MP4 media player this year? Then look no further than this baby, which does everything the name brand PMP's do, but at a much friendlier budget price. This model supports a substantial array of media playback formats and has an excellent menu navigation making it easy to float between the many media features. Whether its movies, music, digital photos, or ebooks you'll have everything you need for a bit of mobile entertainment wherever you go. The beautiful widescreen display will make sure you enjoy every minute of use (and will make you wish that ride home was even longer!). Do yourself a big favor by stocking up on this new item to sell at your online / physical store or feature it in your latest eBay, Amazon or uBid listings and use our blind drop shipping service to maximize your limited resource of time. Primary Function: PMP (portable media player) with 3" wide screen and 8 GB's of memory. Very nice mp4 player. It was everything great. Just if it was touchscreen it would had been better. Very nice and friendly menu. on 2009-01-08 04:48:35 Fantastic picture and sound in a slick light unit with a lot of memory. I received 3 of these units in perfect order (well packed) via Air Mail to South Africa within 8 days of placing the order on the Chinavasion website on 31 December 2008. My interaction with Chinavasion during the order process was more professional than any dealings I have ever had with any other firm to date and the shipping proceeded far beyond my expectations. The Hot New 8GB Widescreen Player with 3 Inch LCD (for lack of a better name) is slim, compact and really really light. I wish I had an electronic scale to give you a figure. It is mostly plastic and that contributes to its light weight. It has no solid feel like the other metal-body units are sure to have, but the light weight also makes it really portable. It is really easy to hold, especially for younger hands. The finish is glossy black and silver with good build quality and nothing shabby about it at all. The screen is fantastic, crisp and bright. Photo viewing on it is a pleasure! It makes a really nice pocket photo album, especially with the 8GB memory. The scaling of the photos produces a fine image without scaling artifacts. The 3-inch widescreen format really is a pleasure to view. Viewing angles are not a problem. I have not yet tested the video playback enough to comment on it, nor have I tried video conversions and all that. The menu system is well worked out, with excellent looking default graphics and a pleasure to use. Connecting to the PC without installing any of the product's software (Windows XP) was easy and as per user manual which came in good English. The stopwatch works fine but I could not yet wrestle any one of the 3 units away from my children to test the other features. Sound quality from the unit is fantastic! Although I do not have pro audio equipment to do formal tests (nor do I intend to). I am a graphics and video professional with 20 years experience and in my opinion can say that the sound and image are beautiful. Volume control is easy and gives smooth volume control. Switching the unit on after shutting down while playing resumes playback where it left off partway through the audio track. Lyrics work well if you have the LRC files. Sound quality from the built-in speakers (headphones unplugged) were surprisingly good. Why only 4 stars? The included headphones sound great but two of them already failed on one channel. These headphones really need prompt replacing (not a deal breaker). The buttons on the front of one of the units got stuck periodically although they do work. All the other side buttons work perfectly. The USB port on the same unit had one pin move out of place and caused the data connectivity with the PC to fail. A quick fiddle with a needle fixed that problem. I have not extensively tested charging times and battery life. Conclusion: I would say this unit delivers on what was advertised. I am only slightly disappointed by the button quality and USB pin problem. Overall I am pleased. What I like about this unit is that it does not resemble an iPod but is a fairly good product in its own right - classy looks, quality finish, easy to hold and carry, brilliant screen, fantastic sound, lots of memory and easy to operate.